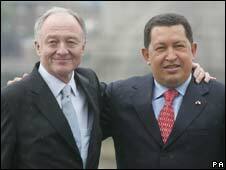 Former London mayor Ken Livingstone is to work as a consultant for Venezuelan President Hugo Chavez. Mr Livingstone, who has long been a supporter of Mr Chavez, will advise pro-government mayors in the capital Caracas on urban planning. He said he was "proud and honoured" to be part of the city's transformation. As mayor, Mr Livingstone struck a deal to swap cheap Venezuelan oil for city planning advice, but it was cancelled by his successor Boris Johnson. After a meeting with Mr Chavez in Caracas on Wednesday, the former mayor said he was pleased that Venezuela would now get the "advice that we promised". The BBC's James Ingham said the two men, who share left-wing political views, hugged each other like old friends. In February 2007, Mr Livingstone signed an oil deal with Venezuela to provide cheap fuel for London's buses. He said at the time the agreement would help provide half-price bus and tram travel to some 250,000 Londoners on income support. In return, the mayor was to offer officials in Caracas advice on municipal transport, environmental issues, waste management and tourism. But after taking office in May, Mr Johnson announced he would not renew the deal, saying many Londoners found it "uncomfortable". Mr Livingstone said on Wednesday he hoped to help Caracas undergo a transformation in the next 20 years. "President Chavez has asked that I continue to work with the city and its new mayors to use the experience of London to actually give form to his dream that this can be a first world city in a first world country," he said. "I am proud and honoured to be in a position to be able to offer my advice to those candidates as they start the task of transforming this city for the benefit of all its people." Mr Chavez is fighting regional and local elections in November. The contests, for state governors, mayors and councillors, are being seen as a critical test of Mr Chavez and his political project. A spokesman for Mr Johnson said he had vowed in his mayoral manifesto to scrap Mr Livingstone's deal and had "kept that promise to the people of London". "Boris Johnson made it clear during his election campaign that he did not want to be on the payroll of Hugo Chavez and did not believe a poor South American country should be subsidising one of the wealthiest cities in the world," he said. "Ken Livingstone is free, as a private individual, to offer his advice and services to whomever he wants."